Hello, GALA members and friends! Eric Lane Barnes here, associate artistic director of Seattle’s Flying House Productions (Seattle Men’s Chorus, Seattle Women’s Chorus, Sensible Shoes, and Captain Smartypants) and composer of songs you may know (Drama Queen, Caffeine Overload Polka, Black Christmas, etc.). As some of you know, in June of 2013 I spent two weeks in Beijing working with The Shining Jazzy Chorus – at that time they were China’s only LGBT chorus. It was an extraordinary experience. I helped them organize their first chorus retreat, worked with them on repertoire, helped them prepare for a concert, led many discussions on organization structure, audience building and long-term planning. In our time together we had many fascinating and eye-opening discussions about the difference between the US and China and how LGBT life shows up in each. We were all struck by the similarities and the vast differences between our two cultures. One night during the retreat I gave them a crash course on LGBT history in the US – many years of historic events they had not been aware of due to the media blackout put in place by the Communist Revolution in 1949. After I finished my US LBGT crash course spiel the director said, ‘I wish we had a Stonewall event in China.’ To which I replied, ‘I think your chorus is part of a Stonewall event that is happening right now.’ It was then I began to think: I wonder if there is a way to bring this chorus to Denver in 2016 for the next GALA Festival. I have received regular progress reports from the Shining Jazzy Chorus since I returned last July. They found a regular rehearsal space through connections with the German embassy. This came as a result of a meeting I’d set up with then American Ambassador Gary Locke, an event which thrilled the members immeasurably. they have implemented a system of section leaders. They have been in the process of developing a mission statement and a vision statement. They have decided (as a result of talking through potential mission statements) to change their name officially to ‘Beijing Queer Chorus.’ Their membership continues to grow, slowly but surely. 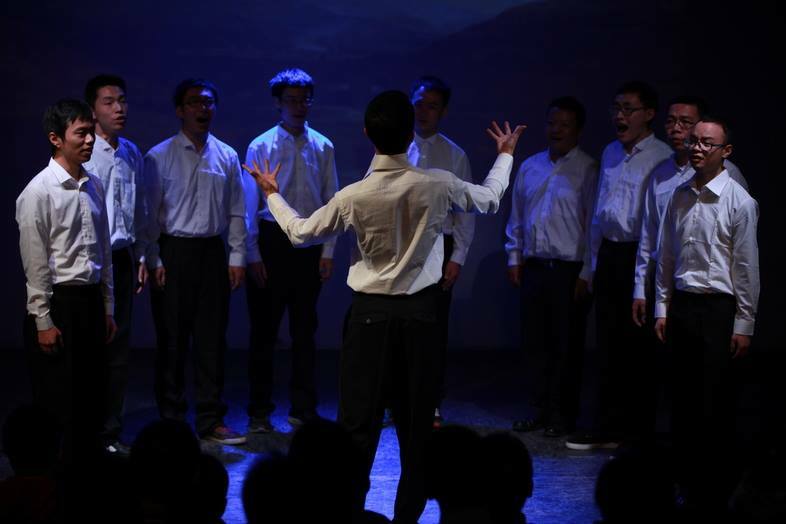 They have even gone to neighboring city Tianjin to help them form their own LGBT chorus. The Beijing Queer Chorus is truly blossoming, at a time when China is experiencing many levels of awakening. It’s a very interesting, exciting time for LGBT folks in Asia. At one point during a post-rehearsal discussion one of the Beijing Queer Chorus members said to me, “We never really noticed ourselves until you came here.” She meant that they had simply gathered together and sang, and sometimes performed, without giving much thought to the possibility that they might be part of a greater social movement. Having someone from outside of Asia come and spend time with them showed them a greater context than they’d previously seen. When they saw that they were already participating in a social movement that had been taking place across the globe for several generations, their perspective changed dramatically. When I asked if they might be interested in coming to the next GALA Festival, they literally leapt to their feet in a chorus of ‘YES!’ I had never felt more like Santa Claus. So here enters the plan to help raise funds to get 10-16 members of the Beijing Queer Chorus to Denver in 2016. We are asking GALA Chorus members to join together to sponsor individual members. We want to be able to cover airfare and incidental costs for the BQC members who are able to make the journey. For these members, it will be a journey of a lifetime, an incredible experience that will impact the rest of their lives. We are estimating the cost of attendance for each BQC member at $3,500. If you you or your chorus would like to sponsor a BQC member please contact us at bqcfunding@galachoruses.org. On behalf of the Beijing Queer Chorus and, indeed, the entire LGBT population of China, I thank you for considering being part of this exciting project. Eric serves as Assistant Artistic Director of Flying House Productions and the Director of Captain Smartypants and the Seattle Men’s Chorus. Eric is the author of the critically acclaimed Fairy Tales, which received numerous awards in Chicago, New York, and London. His scores and scripts for Chicago’s Lifeline Theatre include Tuck Everlasting, The Amazing Bone, Simple Jim and His Four Fabulous Friends, and Mike Mulligan and his Steam Shovel, the latter of which has toured the USA and has enjoyed many successful regional productions. His musical The Stops, a show about the lives of three lady organists, was awarded Best Musical at the 2006 National Gay and Lesbian Theatre Festival and opens at San Francisco’s New Conservatory Theatre in June of 2011. Eric’s most recent show Rapture of the Deep was written with the help of a grant from the City of Seattle Office of Arts and Cultural Affairs, and was the first show of Balagan Theatre’s current season. Since their inception in 2000, Barnes’ ensemble Captain Smartypants has performed with Margaret Cho, Jennifer Holliday, Kristin Chenoweth, American Idol finalist Blake Lewis and many others. Captain Smartypants has toured the Northwest and beyond with their shows Sticks and Stones, Undercover, Trousers of Terror, PowerPants, Cirque du Slaque and Air Smarty. ‘Fruit of the Month Club’ and ‘Undercover,’ Smartypants’ two CDs, are available online through iTunes, CD Baby or flyinghouse.org. Their video performance of ‘Kislev Cowboys’ (aka ‘Brokeback Dreidel’) has received over half a million hits on YouTube since it posted in 2008. Their 10-year anniversary show ‘Captain Smartypants: the First 100 Years’ broke all previous Smartypants box office records in its run at Seattle’s Town Hall in May of 2010. Recently Eric wrote songs and underscoring for the independent films In-laws and Outlaws, Waxie Moon, Seattle to Ghana and the upcoming Fallen Jewel.